Whether or not we like it, at some point in our lives we will all have one or more skin blemishes on the face. Whether it is from a hormone pimple, sun burn, healing chicken pox or persistent acne, there is no denying how absolutely annoying and embarrassing they can be. Some people are unfortunate enough to have them as persistent occurrences and this can, in the long run, lead to some pretty serious self-esteem issues. The good news is that there are actually a lot of things you can do to either reduce or completely get rid of blemishes on the face. Below are a few less talked about but super effective skin blemish remedies. Use of lemon juice is the mother of all facial skin blemish home remedies. But who can complain when it works so well? Everything about the juice serves a purpose in removal of the blemishes. The vitamin c promotes formation of collagen which accelerates healing and makes the skin nice and firm. The acidic aspect of the juice on the other hand acts as a natural bleaching agent and this comes in handy when dealing with skin hyperpigmentation and other dark spots. Adding turmeric powder to form a paste is a new and highly effective twist to the old remedy. The two work together to clear up clogged pores which quite literally allows your skin to breath. This works on both localized and widespread skin blemishes. The gel has a special compound referred to as anthraquinone that has a bleaching effect on the skin and acts by getting rid of dead skin layers that contribute to the darkening and skin blemishes on the face. The gel is great because it is less harsh than acidic alternatives and can therefore be used by people who have acne and other skin conditions characterized by open wounds and increased sensitivity. The best way to get the most out of aloe vera is by grinding fresh leaves for the gel but you can also use ready-made extracts or aloe vera-based soaps and oils. Apply the gel and peel after about ten minutes at least once a day. 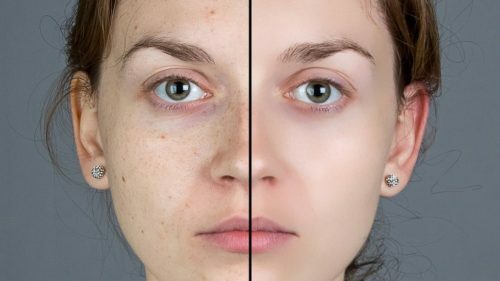 This is one of the lesser publicized ways of getting rid of red skin blemishes on face but is one home remedy that is yet to disappoint. It is as simple as mushing ripe tomatoes and applying the paste on your entire face or simply the affected area then massaging gently for a few minutes. After this, rinse off with some warm water and pat dry. Do this at least once every day and you will be appreciating the results in no time. Vitamin C in the tomatoes contributes to collagen formation, the antioxidants reduce cell death while lycopene slows down melanin formation to counter hyperpigmentation due to prolonged exposure to the sun. Vinegar is very harsh but also very effective when it comes to getting rid of skin remedies. If you have widespread red blemishes or active acne then this is probably not the way to go. However, if you are dealing with small blemishes then the vinegar will work wonders like you have never seen. This simple remedy involves applying the vinegar on the spot using cotton wool or cloth and leaving it on there for about five to ten minutes. For the best results, this should be done at least twice a day. The ethanoic acid acts as a natural bleaching agent and is therefore ideal for blemishes causing skin discoloration. This is very effective in getting rid of localized blemishes especially those caused by pimples. However, you can use it on the entire face without any serious repercussions. The aspirin is crushed and mixed with a little calamine lotion or oil then applied on the blemishes. Leave the paste on for about fifteen minutes then rinse off. The aspirin works by reducing inflammation and pain while slowly weakening the pimple. The calamine oil promotes absorption of the aspirin and itself acts by promoting healing and reducing hyperpigmentation. Potato juice also acts as a natural bleaching agent and with the mild nature of its extract is safe for use on sensitive skin for widespread blemishes. The potato is peeled then crushed and mixed with water to form a pasted applied on the face as a mask. The potato juice acts by getting rid of dead skin layers leaving you with clearer and smoother skin when applied at least once a day. This might sound unusual but it is one of the most effective ways of getting rid of blemishes on the face. The pure earth acts by absorbing excess oil from the skin surface and unclogging blocked pores. The almond oil contains a high concentration of fatty acids whose special structure assists in breaking down oils in sebum that block pores. The fatty acids themselves also act as a protective barrier like sebum does only without the pore blocking effect. The milk helps get rid of dead skin layers and keeps the skin supple and smooth. This unique combo works wonders on skin blemishes due to acne, eczema and psoriasis. Retinoid, whether consumed or applied, are super effective when it comes to management of acne and other forms of skin conditions. When used as a cream, it helps by getting rid of bacteria that causes inflammation, preventing clogging of pores and clearing those that are already blocked. When consumed, it has more or less the same effects without the preventive aspect. Retinoid treatment might be DIY but as a carefully regulated drug requires a professional subscription. If you have tried everything and the results are not satisfactory then laser treatment might just be what you need. The treatment is especially effective for getting rid of red blemishes on the face. The concentrated beams break down top blemished layer of skin allowing growth of new and healthier skin. It requires a few treatments but is very effective and by the time you are done you will have a blemish-free face to enjoy and show off. This involves literally sanding the blemished skin to get rid of the uneven layers caused by accumulation of dead skin and uneven pigmentation. This works on age spots, blackheads and pimple scars. It is highly effective but is not recommended in cases of increased skin sensitivity such as acne and sun burns. DO stay hydrated. Drink lots of water every day; even when you do not feel thirsty. DON’T leave the house without applying sunscreen. DO eat healthy. A balanced diet keeps skin smooth and healthy. DON’T mix skin remedies. Especially when they involve potentially irritating ingredients. Choose a treatment and stick to it. DO exercise regularly and detox to get rid of toxins that could cause skin blemishing. DON’T pick at skin scabs and pimples. You might end up making things worse by introducing germs. DO clean your face with clean water and mild soap at least twice a day to get rid of dirt and oil hose build-up could result in blemishing. DON’T use irritating treatments on sensitive skin. DO seek professional advice when in doubt and when dealing with serious conditions such as eczema and acne. DON’T be afraid to try out new natural skin care remedies.